Sensational home with stunning gardens with stream, games room, tennis court and al fresco dining with kitchen! Al fresco dining room and kitchen! The house is a wonderful period country property set in arguably one of the best locations in the area at the end of a no-through road accessed only by horses, bicycles and walkers. It offers beautiful family accommodation with reception rooms including a stunning double height galleried dining room and a bright airy conservatory overlooking the gardens and Edwardian fish pool. The property has been renovated by the current owners to a high standard, blending the character of the property with the requirements of modern living. The living room and dining room are perfect for entertaining with French doors opening out onto the stunning garden. Wood burning stoves provide added cosiness on colder nights. The orangery also has a wood burning stove and plenty of space for relaxing. The tennis court is floodlit and there is also a half sized snooker table and table tennis. The gardens include a formal rose garden with fountain, waterside gardens and plenty of lawn space. There is a brick built, solid fuel barbecue alongside the terrace for outdoor meals. There is plenty of space for parking on the drive and covered parking for at least two cars. Please note, in regards to allergies, the owners have a dog which lives at the property when they are in residence. 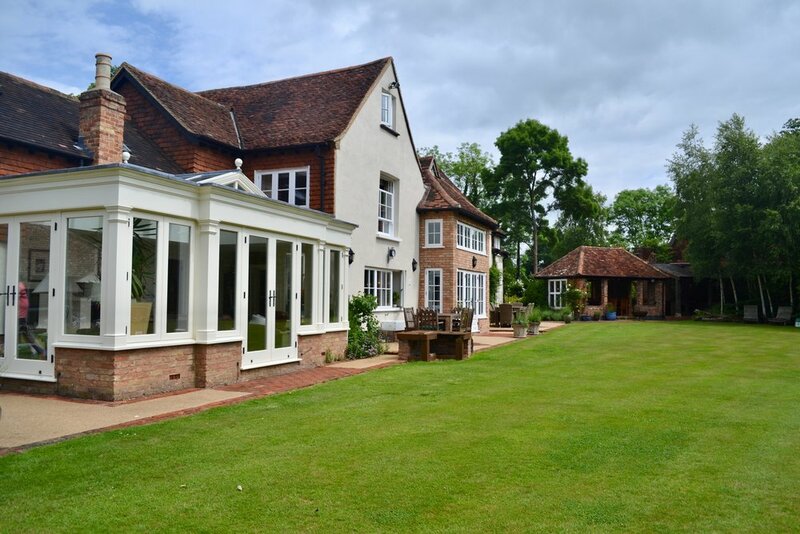 Situated just outside the town of Chobham in Surrey, this beautiful house is ideally located for a short break, with easy access to London via the M3. Nearby is Ascot, home to the Royal Ascot, while Windsor Castle is just further north and certainly worth a day out, especially for the Royal Windsor Horse Show held each year. For aviation enthusiasts, Farnborough, home of the Farnborough International Air Show, is just a few miles along the M3. Chobham itself offers all the local amenities you could need to enjoy a relaxing short break away! Day to day shopping, attractive boutiques and specialist shops in a typical English village setting, exceptional pubs and restaurants within easy reach and the beautiful Surrey/Berkshire countryside (Savill Garden, Virginia Water Lakes, Chobham Common, Runnymeade, Wisley RHS Garden) on the doorstep.